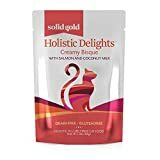 There are several flavors available in this particular choice, so you can easily find an option that your cat finds delicious, including anchovy, sardine and salmon, chicken, and duck. 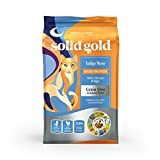 Regarding cost effectiveness, there are also several options for the size of the bag you opt for, from a small 2.5lb bag, up to an enormous 12lb bag, which will certainly last you a good portion of time! The price is good here too. 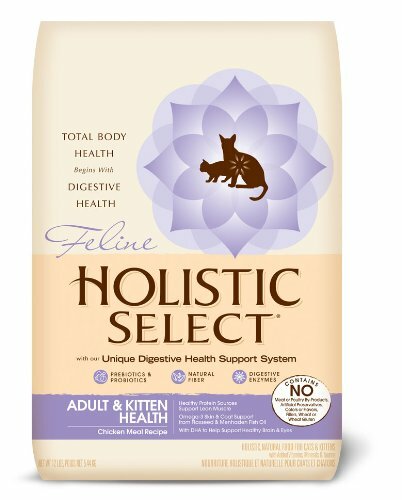 Holistic Select foods are all made with a Digestive Health Support System, which means that the ingredients are carefully balanced, including active probiotics, fibers, and digestive enzymes to aid easy digestion and stomach health. The ingredients are all totally natural, and the meat flavors come from real meat content. There are no corn, no by-products, and no artificial ingredients.